Ad hoc: "For temporary relief from hunger." Nothing could be further from the truth. By this I mean that Thomas Keller's little off-shoot, the casual establishment just down the street from that little place called The French Laundry in Yountville, CA purports to be something just for kicks, just to get you by, a little something for the community, to give back so to speak. And, although the place is understated and minimalist by design, the food is still marked by T.K. 's magic, simple yet beautiful, unpretentious yet expertly prepared and presented. So, although I didn't get to eat at The French Laundry this trip (maybe someday...) I did have a great time with my friends at the little place down the road. There was no mistaking the garden in back, the focus on seasonal and local ingredients (many from as close as within a 5-mile radius) and the attention to the minimalist, ingredient-driven philosophy for anything other than what it was. In fact, the idea that this uber-famous chef who never appears on t.v. and owns arguably the best restaurant in the country could actually be in the kitchen every night cooking just down the block made it all somehow even more exciting. I had the thought that maybe Ad hoc was T.K. 's 'test kitchen', or the place where TFL staff go to have a beer on their night off. And, although it seems that most celebrity chefs live in exotic locales far from the kitchens that made them famous, I actually saw Mr. Keller that afternoon walking down the street in his chef coat on the way to work! The menu was the first hint that the modest restaurant was expertly intentioned and stylized: it came in a brown file folder with the daily changing four-course menu attached to one side, the wine and beer list to the other. I love the idea of not having to choose and we got pretty lucky with the menu that night. We also got lucky in that my friend's husband who works at Bouchon (the third T.K. restautant in this tiny town in Napa Valley) had called ahead and told them we were coming. Not that we got triple VIP treatment or anything, but they did offer us each a glass of Diebolt-Vallois "Blanc de Blancs" bubbly right as we sat down. And the blue jeans-clad staff was super friendly and laid back. After snacking on the fresh bread made around the corner at Bouchon Bakery, our first course arrived: Chickpea and Spring onion soup (TFL garden spring onions, thumbellina carrots) with chicken liver mousse on baguette croutons. It tasted like Spring in a bowl. I loved how everything was served family-style. They brought out a cast iron pot and set it on the table for us to serve ourselves and it somehow seemed even more delicious that way. Next was the Elysian Fields farm roast leg of lamb, served with Iacoppi english peas, pea shoots and smoked ham, grilled romaine and roasted marble potatoes. Again, the serving dish and utensils were set down before us and we served it up. The lamb was perfectly cooked and the veggies were all so fresh and green, the peas large and bursting with bright flavor. My only complaint was that it was a bit too much food for three people. To drink, our server recommended a Joseph Swan Pinot Noir from the Russian River Valley. How thoughtful of her. This trip was so wonderful, it's hard to know where to begin. So I'll start by saying that there is no better weather in Spring than in Northern California. I know it does no good to complain about the weather (like when I stepped out of the aiport in Nashville and the first thing out of my mouth to my man was not "Hi honey! So happy to see you!" but "What the hell is going on here with the humidity? It's disgusting and when did this start? and WHY do I live here??!! I want to go back to California!!" Ok, so I know how to overstate things. Especially obvious things. But I think he still loves me and missed me. This was my first trip to California since my own personal food revolution had begun. And one of the things I couldn't stop noticing is that everything, everywhere in No.Cal. is "seasonal and organic." It's like Mastercard and Visa out there. There is not a restaurant serving anything that's not seasonal and organic (at least by their own claims). Even the one 'regular' meal I had with a good friend, Andy, from college --we ate sushi in the small town where he lives-- had "local mushrooms" in the miso soup. It was very tasty, I might add. So... where to begin with the food? The food! It is everywhere, it is beautiful, it is high-quality, it is super abundant and fresh everywhere you go, especially in the Spring. There were fava beans, English peas, Spring onions, new garlic, green beans, morels, baby lettuces, and more. The strawberries and the wild fennel on the side of the road were waving goodbye as the cherries were being ushered in. And the seafood? How wonderful to find three or four main seafood options on every menu. Everything from Northern halibut to arctic char to local cod and Tomales Bay clams. It was an embrassment of riches. One would never have to eat meat again. But even the meat and poultry in many of the places I dined came from farms, ranches and fisheries guided by principles of sustainability. It's like I was plopped down into my best dream of eating exactly the way I want to eat and although I knew that California was way ahead in the local, seasonal and sustainable game (in fact they started it), it was still a very pleasant surprise and I am inspired --again-- to cook, shop and eat this way as much as I possibly can. I should point out that my girlfriend, the bride, is the Special Events planner at Auberge du Soleil, a fabulous, luxury resort and spa in Napa. So when she took me and another friend there for lunch on the day before the wedding, we were 'styled' beyond belief: wined and dined and given as much attention as if we were famous celebrities. It was FUN. Note to self: Next time (when you're rich and famous) you need to STAY at the hotel so that after the six-course lunch you can walk down to the pool and lounge in a cabana and never wake up, ever. Until dinner. 1) I attended a wedding this weekend and the wedding cake looked beautiful but wasn't that good, mainly because I'm convinced they used some type of buttercream substitute. 3) because I just learned how to make Italian buttercream at work today! But I don't have enough time to give you the book-length and well-researched version on the topic with I would love, love, love to give you. So, suffice it to say that buttercream is good. It is a necessary tool in the baker's repertoire. 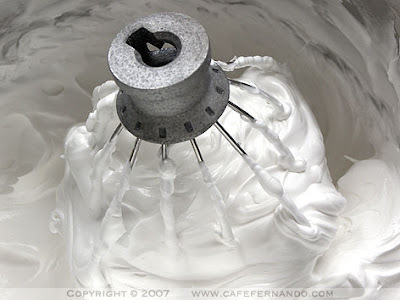 It is varied (there is French, Swiss, American and --the best of all--Italian buttercream). Colorings or flavorings are often added to it like vanilla, nuts, espresso and chocolate, and it is widely used in cake decorating because of its stable and easy-to-use consistency. It can be piped, reworked in any number of ways, softened for fondant, hardened for decorating, etc. etc. The Italian buttercream we make at work for cakes (recipe and technique by Tom Huber) is made by whipping egg whites, heating sugar and water to 242 degrees and then adding the sugar liquid slowly and steadily to the egg whites and beating until it looks like perfect, shiny, just-fallen snow. Then you throw in chunks of softened butter, lots of it as you can imagine, and beat some more until it looks completely different but tastes divine and can be spread easily. If you need to chill it and use it later, simply soften it in a stainless steel mixing bowl and apply a blow torch to the bottom and sides of bowl. Or do whatever it is you do to soften stuff. So, there you have it. I've never tried making buttercream at home, but will soon. There are lots of different recipes, like I learned today. But this one is pretty darn good. Try it the next time you have to make a wedding cake. (That was a joke). I am about to leave town again --this time for Northern California. Yippee!! I am going to the wedding of a very good friend in Sonoma, then to Berkeley and other Bay area towns to visit friends and family. So, for now I have reservations at Ad Hoc in Yountville, the Thomas Keller casual offspring of The French Laundry, where every night is a four-course family style set menu, all the chef's choice. I love the idea of not having to go through the agony of decisions and anxiety that is produced when making choices like what to order in a place like that! Whew. Thomas and his staff will have it covered and I am sure it will be incredible. Then I will visit friends in Berkeley where I and one of my Italian friends from grad school have reservations at Alice Waters' Chez Panisse. I've never eaten there and Alice is one of my idols so I'm really looking forward to this. We may also visit her Edible Schoolyard project which would make the trip educational as well as super fun. So, needless to say I will be blogging about all of this but it may be a few days before I can get to the computer. I trust you'll all still be there when I return. California here I come! It's true, I have not posted in a few days. This is because I have been "cleansing," i.e., taking a break, exercising some much-needed moderation after an indulgent few days in Atlanta and in preparation for a decadent Bay area trip coming up soon. Every once in a while it's a good thing to lay off the desserts, the pasta and the heavy food. It's not fun. But it's a small price to pay and it makes the return to real food that much more enjoyable. This week I have been juicing fresh fruits and vegetables, eating whole grains in small quantities and only steamed vegetables for dinner. I eliminated coffee and alcohol, sugar, dairy and meat. Needless to say, I feel great and have lots of energy. But I am in fear of being too virtuous to the point of being boring. That's a preoccupation of mine. I don't like to be too good. It cramps my style. I will, however, continue to take a break from some things that I tend to over-indulge in, like coffee and sweets. But I had to get back to cooking! I missed it terribly. Juicing is all well and good and much can be said about the beneficial nutrients in pure carrot, beet, kale and apples in the form of juice. But too much purity can be a bad thing. It can make you weird and edgy. And cause serious lapses in judgement. But I digress. My firt meal back was a good balance between tasty and healthy: mushroom and barley "risotto." I am not typically a fan of healthy substitutions. I would rather eat small amounts of the real thing and load up on vegetables in lieu of meat-centered meals. Whole wheat pastas, for example, have never really appealed to me. I prefer the real thing, homemade and fresh if possible. But I thought, for this week I could give those alternatives a try and see what happens. Thus, the barley risotto. And, actually, it had a nuttier, full-flavored intensity that matched the creamier, arborio rice version. I also used less butter, less cheese and a mushroom broth I had in the fridge from something I had made a little while ago. That, combined with the woodsy flavor of shitake mushrooms elevated this risotto from the realm of hippy-dippy health food to a truly delicious dish. I just returned from a great little getaway to Atlanta. What a quick and easy drive, I told myself on the way down in the car with my pal, Jaya. "We need to do this more often!" was all I could think about. I was even more impressed when I got there and learned what a fun city Atlanta is. Great restaurants, good shopping, funky neighborhoods--all things that are rather lacking in Nashville. I guess what I appreciated was the urban vibe of a big city in the South, a cool combination of Southern charm, sultry weather and hip, trendy establishments. No wonder Beyonce hangs out there. We went there to catch a concert on the new tour of my all-time favorite band Radiohead . I would go to the ends of the earth to see their show, but luckily I could just hop down to Atlanta. I've seen them twice before --in Florence, Italy and in Denver --both about 5 years ago. So I was delighted to rekindle my obsession with the best live rock band in the world (and that's coming from Rolling Stone, not just me the geeky fan). Aside from my favorite band, Atlanta held the promise of an exciting restaurant scene I had been hearing about for some time. We ate in three very good places, all of them recommended by either friends or food magazines and I was eager to check them out. ...and supposedly they have the world's best pancakes too so we tried one of those too. Very light and fluffy. and just had to try three bites of a biscuit with homemade jam. Almost three years in the South and I am still not able to pass up the temptation of a homemade biscuit. Wow, that strawberry jam could have been the best thing I tasted all day. But the sandwich was no loser either. I would haved loved to go back there for a proper breakfast or for brunch on the weekends where I'm told all the cool kids line up out front to get a seat at the retro bar. That night we had drinks in a little gastropub owned by the team of Restaurant Eugene across the street, called Holeman and Finch Public House. Fancier than I thought it would be, it had a very European vibe --again with a Southern twist-- and meat was a theme: there were cured meats, prosciutto and sausages hanging from the ceiling. The wine list focused on unique offerings like the Pinot Noir Rosé Frizzante from Austria that I had. My friend ordered a really good cocktail made from Aviator gin and lavender, and we tasted some crawfish beignets with citrus vinegar that were very just enough to get the idea of the place's vibe. I would definitely go back there. For dinner that night we had reservations at Floataway cafe (1123 Zonolite Rd., suite 15; www.starprovisions.com). This is the casual, less expensive sister to Bachanalia, consistently named one of the best restaurants in Atlanta. I loved this place. It's located in a converted warehouse and you walk in through a dimly lit courtyard that smelled of jasmine and made you think you could be in Italy or France. Inside the industrial facade and airy open space gave way to a very breezy and contemporary decor. The food was minimalist and ingredient-driven, with a menu that changed nightly and offers some of the region's finest local ingredients. I had a salad of local cutting celery and Spanish white anchovies with manchego, lemon and olive oil, and a main dish of handmade tagliatelle with local morels and spring vegetables. Both were outstanding. The picture doesn't do the pasta justice so I'll leave it out. Jaya had an interesting risotto with spring onions, local fava beans, rhubarb and house cured bacon, and Monique had pan roasted north Georgia trout with baby spring onions and english peas that melted in your mouth. ...warm honey ginger pudding with sel gris ice cream (hello? ), and rhubarb crostata with orange zabaglione. Need I say more? And, last but certainly not least, I got to try the much-lauded Watershed Restaurant where award-winning chef Scott Peacock offers his Edna Lewis-inspired country cooking with fresh, local and seasonal ingredients. We went there for lunch and I wished I could have ordered everything on the menu. If I lived there I'd either work there or go there everyday for lunch and dinner. It was such a beautiful space with that same open warehouse style of the night before (it's a converted gas station next to a dry cleaners) and a casual modern feeling inside. From the outside it doesn't look like much but the place gives you a feeling of open simplicity with pale colors on the walls and a design that mimics the menu in its fresh use of organic ingredients. and a salad of local greens: watercress, spinach and arugula. I never thought chicken salad could taste so good. This is the hot vegetable plate--a beautiful version of the meat n' three without the meat but with a slew of thoughtfully prepared Southern hits like turnip greens, lightly and delicately fried okra, stewed tomatoes, sweet potatos and gingered beets. It was sooooo good. And I can't even begin to tell you how good this chocolate cake was. They called it "very good chocolate cake" for a reason and boy were they not lying. It was rich and light and decadent all at once. It could be the best chocolate cake I've ever tasted and I'm not a huge fan. I prefer my desserts with fruit and cream, but this was ridiculously good. The concert was a blast and I returned home with Radiohead playing in my ears and the memories of good food, promising to make another trip to Atlanta someday soon. Here it is -- what you've been waiting for-- and I assure you, it's worth it. You should go out and get some lemons, some eggs and some berries and MAKE THIS NOW. It's one of those desserts--perfect for a dinner party-- that look really difficult and taste divine but are really easy to make. You don't need to be a pastry chef to do this one! 'Semifreddo' is Italian for half-frozen because this ice cream-like dessert never fully hardens but is cold and delicious. It can be made with many elements--other fruit juices, chocolate, nuts... just replace the lemon juice with some other flavor. I always order them when in Italy as they're one of the more ubiquitous desserts in a country that doesn't indulge too much in the after dinner sweets. Set bowl over large saucepan of simmering water and whisk until thickened, about 4-5 min. Remove bowl. Using electric mixer, beat mixture until cool, thick and doubled in volume, about 6 min. Fold in chilled whipped cream. Transfer mixture to prepared loaf pan and smooth top. Fold plastic wrap over top to cover and freeze at least 8 hours, or overnight. This could be done up to 3 days ahead. Keep frozen. When ready to serve, mix remaining sugar with berries and spoon alongside the sliced (1-in thick, crosswise) semifreddo. On Saturday night I hosted a dinner party for my friend Jenny. She celebrated a big birthday the week before while I was away and I missed her party, so I wanted to do something for her. I told her to invite some friends and I would do all the cooking as a gift. I thought I would make homemade pasta. The last time I did it was for Thanksgiving when I made tortellini di zucca --pumpkin stuffed tortellini with butter and sage. It had been way too long. So I broke out the pasta machine having recently been inspired by Claudia's unbelievably good spaghetti with clams, by way of Thomas Keller. I decided to try my own linguine with clams. For the pasta, I combined Claudia and Tom's with my old trusty Marcella Hazan's Classic Italian Cooking recipe. I know a thing or two about making pasta and Claudia's was super good, but for my money Marcella is the hands down expert on old school Italian and I had to go to the source. I used about 3 cups of flour (2+ cups a.p. and almost 1 of semolina because I wanted that particular texture, but usually I don't use semolina), 1 whole egg and 6 yolks. The ratio of flour to yolks is up for debate, but if you want that eggy, bright yellow color and smooth texture, the more yolks the better. Marcella says 2 whole eggs for every 1 3/4 c. flour. I also added a drop of milk and a few glugs of olive oil --not recommended by the Master but this dough was really dry at first. After a solid 10 min. of kneading (and a little cussing) it came together just like it should. I wrapped it and let it rest for about 15 min. before cutting it into sections, folding each one and putting it through the machine a couple of times. After drying for a bit, but not too long or it will break in the rollers, I put it through the attachment for wide, flat cut pasta. I guess it was technically fettuccine, not linguine, but who said anything about a pasta quiz? Don't even get me started. In Italy I have seen pasta of countless shapes and sizes with names like "strozzapreti" ('strangle the priest") so don't slag me off. My machine has only two settings. My sauce was simple and inspired by something I saw in bon appetite this month--just a broth really, with sauted onions and garlic in butter and olive oil, a couple of chopped tomatoes and lots of white wine and 1 cup of water. This simmers for 20 min. and then you can turn off the heat and finish when ready to cook the clams, so this can be done ahead of time. When you add the clams, also add a couple of pinches of red pepper flakes, 1/3 cup chopped fresh parsely, 1/4 c chopped fresh oregano and thyme. I cooked the pasta in the same broth after lifting out the clams and setting them aside. Then I threw them back in with the pasta to heat them again and that was it. Just be sure and serve it up with extra fresh parsley and some toasty warm bread for soaking up the broth. Now, don't get me wrong, the spaghetti with clams and a ton of butter that I had chez Claudia was rich and dreamy and soooooo delicious and I would love to eat it again someday. But I was cooking for a crowd of people-- most of them unknown-- and I didn't want to unintentionally cause someone to have a coronary at my house due to the insane amounts of butter AND yolks I'd be serving in this dish. This way, I reasoned, I could kill them with the dessert, a dessert so good I can hardly wait to tell you about it... in my next post. It's too good to leave til the end at the end of long day, so stay tuned. It is becoming a distant memory now--the desert, the flowers, the food and the family. Well, not the family because they're never far from my thoughts. We're a tight knit family and not least because of the loss 8 years ago of our leader, our matriarch, our loving Italian mamma. So it seems I have stepped into the role of entertainer and provider for my family (in the kitchen that is). I am just like my mom in that I love to entertain and I pretty much seamlessly stepped into her shoes. And those are no small shoes to fill. My mom used to host my brother's entire football team every Thursday night for pasta dinner. And the parties at our house were numerous and well loved by all. So it was that when my brother decided to bring home 9 of his friends from New York for a backyard cook-out, I did what I could to make it a party. There would be almost 20 of us. My brother and his friends all work together at a great place in NYC called Freeman's on the Lower East Side. All really nice, very hip and fun guys and girls. And all restaurant people. I decided to make it simple and grill some chicken and burgers with all the sides, a caprese salad and a big fruit salad for dessert. They brought the beer. I made it all happen. I did the shopping at a place called Fresh and Easy. I had never heard of the place, but apparently it's a UK-based chain of grocery stores providing fresh options for people in a pared down environment of no frills shopping. Whole Foods it's not, but neither are the prices! I was amazed at the fresh options, the variety of meats and cheeses, fruits and vegetables all displayed in individually wrapped clear plastic (one flaw in all the good--too much plastic). I was told that the system is all about putting out only the freshest and as soon as an item has been on the shelf a day, it is marked down or removed and something newer takes its place. I found everything I needed and more - all very fresh and CHEAP. I almost was suspicious at how cheap it was. But I checked out their site and found their philosophy to be all about providing options that everyone can afford. And, on top of that, they carry some pretty cool imported things that you wouldn't find anywhere else, like Cotswald cheese, Spanish membrillo and jamon serrano for only $5!! The whole thing had a very Euro vibe which I liked. And there were very friendly people working there and no clerks --you check and bag your own groceries using your own reusable bags. I was sold. Maybe we'll be getting one in Nashville one day... right now they're only on the West coast. So the shopping done, I went home to chop and wash and prep the meats while my dad and daniel prepared the grill and set up for the party. Once they arrived we fired up that old thing and one of the sweetest of the bunch named Nicky stood at the grill and flipped burgers and chicken for me while enertaining us all. What a great guy. And then the next night we had another dinner for just the family and I had promised my dad I would cook him his favorite--rigatoni with red sauce and sausage. My aunt and her husband joined us and her dessert was the best part of the meal in my opinion. Berry Pavlova. A base of meringue topped with whipped cream and berries. Yum. I will have to try it some day. As you can kind of see (it was getting dark) it was dripping with gooey, fruity goodness and it tasted even better than it looks.